for the inverted Gearing: is ist possible to do the side change not at the Engine but at the lever? Yeah for sure, but not with this lever what I have installed. 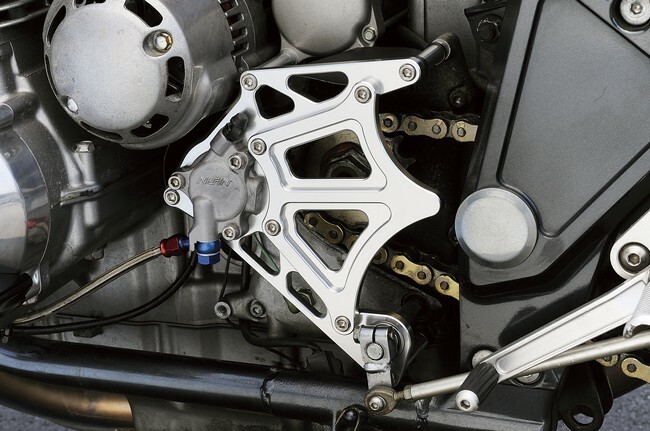 I have found cool "sprocket covers" from japanweb bike. Those have supporting bearing for gear axle and are slimmer than original. There are couple more models, but this is quite cheap. Front-end swap is going forward. Now I have both triple clamps and also new bearings. Stems pressed out and dimensions figured out. Need bushings to both clamps. Not bad, only lathe work, let's see how I can turn those bushings. Ktm adventure upper triple has 15mm offset or stepped down crank compared to original top yoke, which is nice, because now I'm all most original fork length. Or maybe not original, but I ride last season fork dropped 20mm or so, and that was ok. So I'm hopeful that handling is not going to be problem. First bushings gone bad. Today was another try and it worked fine. Upper triple bushing also ready, bearings replaced and time to testfit the forks. Lot's of work still to do, ignition switch, new headlamp brackets, Speedo bracket, fender and not to mention wheels. I have been looking Alpine wheels, but they are so very expensive that I try to figure out some another way. Let's see, long winter though so I have plenty of time. First major problem. Top triple is hitting the tank. At first I was thinking that I need to get some custom top yoke, and that is still best option, but for sure, first I need to try all possible solutions. So i hammered tank lip down , lowered tank as match as possible, and last, cut openings to the top yoke. I also had to rise yoke 5mm to get better clearance. Now I think that I could, at least start with this combination, and if handling isn't good I might order both triple clamps in different offset. I hope that top yoke is still strong enough. If handling is good, I might order only upper triple and rise the tank back to it's original position. Or not. Argh. There are too many different things to consider. I think I open another beer. First picture is showing how it's now turning. Second just to show tank position, almost touching Kleenair plate bolt. Don't know if this will help or you have already fixed the problem, but I had a similar issue when fitting different yokes/triple clamps to my 1100. I notice you only have one head bearing locking adjuster ring nut fitted. I had the same thing happening which left the yoke on top of it sitting too low and hitting the tank on full lock. I had another steering stem made, slightly longer which then enabled both locking ring nuts to be used as original, and thus raised the top yoke up to the correct height . hope that makes sense! Thank's for your reply Eddie. I do have both locknuts, and now I have replaced upper nut to thicker one, and thinner washer under the top nut. I'm going to start with this, and see how it works. Meanwhile, when saving some money for new wheels, I have been doing some electrical wiring. Ignition switch need to go, and some secret latching relay system is taking over. Top yoke also finished. Not very happy with it, but it will do.